In order to justify monetary tithing (or any other kind) under the New Covenant, you have to give Scripture a major rehaul. Let’s begin with scriptures taken out of the Old Covenant (where tithing belongs). Change to: And all the tithe OF THE FRUIT OF YOUR LABOR, whether of your savings in the bank, or of the Fruit of the Federal Mint, is the preacher’s; it is holy unto the preacher. Change to: If some poor widow wants to borrow back some of her tithe money to eat, charge her 20% interest. Change to: And concerning the tithe OF YOUR WORK WAGES, or OF YOUR POCKETBOOK, even whatsoever passeth out of an ATM machine, the FIRST part of it shall be holy unto the preacher. Change to: The tithe payer shall inspect his paycheck to make sure he gives the BEST (biggest) part of it. If he changes his mind and decides to substitute a prettier hundred dollar bill, he should just empty his wallet and fast until the next payday rolls around. Verse 34: These are the commandments, which the LORD commanded Moses for the children of Israel in Mt. Sinai. Change to: These are the genetically modified commandments, which the PREACHER commanded the church in Atlanta, Ga. The next verse will blow you out of the water! New converts, hide your eyes! Verse 26: And thou (the tithe-payer) shalt bestow (spend) that money for whatsoever thy soul lusteth after; for oxen, or for sheep, OR FOR WINE, OR FOR STRONG DRINK, or for whatsoever thy soul desireth: and thou shalt eat before the LORD thy God, and thou shalt rejoice, thou and thy household. Change to: Get rid of the wine and strong drink, for heaven’s sake! Old Testament folks didn’t know they were supposed to drink Coke instead! That money's supposed to go into MY church treasury! Must be a translational error! And the preacher shall spend that money for whatever his soul LUSTETH after (true): for a new car, a bigger and better suit, or for a trip to Hawaii, or whatever his little old heart desires: and the poor tither shall go home broke and eat leftover pinto beans in front of an old TV set, and he shall grumble about it with his whole household. Verse 27: And the Levite that is within thy gates; thou shalt not forsake him; for he hath no part nor inheritance with thee. Change to: Hey, wait a minute! Aren’t preachers “spiritual Levites” and ordinary Christians…what tribe do THEY belong to? Poor little pew Christians, they ain’t got no tribe, so they’d better pay up! Anyhow, the spiritual Levite that's hollering at you from up in the pulpit, thou shalt not defraud him of HIS tithe. He’s got a brand new car and home, and might inherit even more from his rich uncle. But having just a little more never hurt, did it? Verse 28: At the end of three years thou shalt bring forth all the tithes of thine increase the same year, and shall lay it up within thy gates. Change to: Every single week (or pay period), before Uncle Sam gets his cut, thou shalt deduct ten per cent of thy paycheck and store it in the church treasury. Verse 29: And the Levite, (because he hath no part nor inheritance with thee,) and the stranger, and the fatherless, and the widow, which are within thy gates, shall come and eat and be satisfied; that the LORD thy God may bless thee in all the work of thine hand which thou doest. Change to: And the spiritual Levite in the pulpit, who owns a nice hunk of real estate, shall consume the third-year tithe which should be feeding the homeless guy, the fatherless, and the widow. Thou shalt tell them to go get a job or they don’t deserve to eat anyway, and the preacher will stop blessing out his congregation for being tithing deadbeats. On a more serious note, why isn’t the whole tithe given to the poor like they did in ancient Israel? I sort of suspect God didn’t want tithes TAKEN from the poor in ancient Israel like they are today! Why, in all my long life, have I NEVER heard a tithing sermon based on this passage? Verse 2: Speak unto the children of Israel, and say unto them, when ye come into the land which I shall give you, then shall the land keep a Sabbath unto the LORD. Verse 4: But in the seventh year shall be a Sabbath of rest unto the land, a Sabbath for the Lord: thou shalt neither sow thy field, nor prune thy vineyard. Verse 5: That which growth of its own accord of thy harvest thou shalt not reap, neither gather the grapes of thy vine undressed: for it is a year of rest unto the Land. Verse 6: And the Sabbath of the land shall be meat (food) for you; for thee, and for thy servant, and for thy maid, and for thy hired servant, and for the stranger that sojourneth with thee. Verse 7: And for thy cattle, and for the beast that are in thy land, shall all the increase thereof be meat. The Israelites observed a seven-year agricultural (and tithing) cycle. Every seventh year the land (and the tithers) got a break. No large-scale reaping was to be done, so no tithes were to be paid. Any Jewish rabbi will tell you no tithes were paid in ancient Israel on the seventh year, and tithes were never collected from the wages of the poor. During the Sabbatical year, people were to take from the land just what they needed for their own personal consumption, and nothing more. How would this set with “conservative” preachers who holler about having a strong work ethic, and making the most (money) out of every waking moment of your life? What if somebody out in the congregation decided that every seventh year he would ditch the factory job, sling on a backpack and go live off the land like the Indians did before the coming of the white man? Today’s tithers simply don’t get that seventh-year break commanded by Scripture. They’re pressured to slave SEVEN years out of seven to satisfy Organized Religion’s hunger for finances. When one job isn’t enough, people are encouraged to work two. Preachers LITERALLY (and wrongly) apply the Tithing Law, while “spiritualizing away” people’s need for physical rest, to keep the cash rolling in. Parents who must work extra jobs come under criticism because they aren’t always there for the kids and “have poor family values”. Think of it. God actually gave the farmer a whole year off every seventh year from plowing, sowing and reaping, besides their weekly Sabbath Day rest. God even cared about the land, which is nothing but dead, wormy dirt! Funny how preachers don’t worry about other Christians dropping dead from overwork. I kinda suspect God is a lot more merciful than His supposed representatives up in the pulpit. Let’s pay a visit to the three verses tithing teachers base most of their doctrine on. But, unlike them, let’s also read (and airbrush to fit their doctrine) other verses in the same context which clarify who this scripture is addressed to. Malachi 2:1: And now, O YE PRIESTS, this commandment is for YOU. Change to: And now, O ye pew Christians, this commandment is for YOU. Malachi 3:3: And he (God) shall sit as a refiner and purifier of silver; and he shall purify the sons of Levi, and purge them as gold and silver, that they may offer unto the LORD an offering in righteousness. Change to: And he (the preacher) shall sit in judgment on those lacking gold or silver; and he shall terrify the sons of Gentiles, and plunder them of gold and silver, that they may offer unto him an offering out of fear. Verse 4: Then shall the offering of Judah and of Jerusalem be pleasant unto the LORD, as in the days of old, and as in former years. Change to: Then shall the offering of Nashville and of Chicago be pleasant unto the preacher, as it always has been, and bigger than last week’s. Verse 5: And I will come near to you in judgment; and I will be a swift witness against the sorcerers, and against the adulterers, and against false swearers, and AGAINST THOSE THAT OPPRESS THE HIRELING IN HIS WAGES, the widow, and the fatherless, and that turn aside the stranger from his right, and fear not me, saith the LORD of hosts. * * *Preachers either ignore this verse or ignore the inclusion of “the hireling” (wage-earner) in this context where God is rebuking the LEVITES, not the people, for failure to be kind to exploited groups of people. Change to: And I, your tithe-collector, will sit in judgment upon you; and I will be a swift witness against sorry offerings, and against adult members who don’t pay up, and against falling offerings, and against those that don’t deduct a tenth from the hireling’s wages, the stingy widow, and the tight-fisted fatherless, and that argue with MY right to take your tithe, and don’t show me proper fear and reverence, saith the preacher in the pulpit. Change to: For I am the preacher who’s trying to tell you God’s wrong here! He said “sons of Jacob” He REALLY means he’s rebuking the sons of the Apache Indians, the sons of the Eskimos, the sons of the Gypsies, the sons of Latinos, etc., who are in danger of being consumed for committing the sins in this passage! Verse 7: Even from the days of your fathers ye are gone away from mine ordinances, and have not kept them. Return unto me, and I will return unto you, saith the LORD of hosts. But ye said, Wherein shall we return? Change to: Even from the days of your fathers the Vikings, the Normans, the Celts, the Africans and the Anglo-Saxons, you have departed from the ordinances of Mosaic Law and have not kept them. Return unto a Mosaic Law never given to your ancestors, saith the Preacher. Don’t’ sweat over the dietary laws, Sabbath laws, circumcision, etc. but be sure to hang onto tithing! But ye said, Why should we return to a church that tries to put Mosaic Law on us when Christ died to set us free? Now we’ve reached the three verses tithing preachers love the most. But how would you need to change them to justify THEIR tithing doctrine? Change to: Bring ye ten per cent of all the paychecks, that there may be money in my (the preacher’s) church treasury, and test GOD to see if he will open up an unexpected source of income and shower you with money, that there shall not be room enough to receive it. * * *So what if Jesus Himself says: Thou shalt not tempt the Lord thy God, or put him to the test (Matt.4:7). So what if the whole Body of Christ, , not some “church building”, is the New Covenant habitation of God (Eph.2:21-22; I Pet.2:5?) Just disregard the fact that things radically changed after the Cross, and you’ll get indigestion if you bring money into the New Covenant House of God, which is the body of the believer (I Cor.3:16; 2 Cor.6:16). Let’s go on to the New Testament, where you’ll search in vain for any command by Paul (or even Jesus) to pay tithes on wages. Christ’s earthly ministry took place under the final days of the period of Law (Gal.4:4). Only after the Cross did the New Testament era actually begin. But even as He spoke of tithing under the Law, Christ mentioned only tithes taken from things which grow out of the earth: mint, anise and cumin (Matt.23:23). Christ did not command His own disciples (or anyone else) to tithe on their wages. Christ modified the law on adultery to include looking lustfully at a woman, but He did not change the tithing law to tax the wages of Christians! Jesus did not support His own ministry through tithes, nor did His disciples. They were (mostly) from the Tribe of Judah, and only the Levites qualified to ask for tithes of any kind (Num.18:26). Many preachers teach that since Jesus made certain laws harder to keep (e.g. the prohibition against divorce and adultery) it follows that He also wants to make other laws more difficult as well, and pass them on to the church. But the plain truth is this: While scriptural teachings on the sanctity of marriage are repeated in the New Testament epistles, tithing was a TEMPORARY ordinance for a specific nation, Israel (Lev.27:34). Tithing was NEVER, NOT EVEN ONCE, given to the Gentile Church by Paul or any other apostle. Paul teaches cheerful, gracious giving ONLY. Paul rebukes Christians for every evil under the sun. But NOT ONCE does Paul remind the churches under his oversight to pay their tithe, or rebuke any church or individual for withholding ten per cent of their income from the church. Did Jesus REALLY come to put His church under a heavier burden than was borne by the Jews under Law, who did NOT have to tithe on wages and salaries? How would you need to change the following verses to justify the kind of “stewardship” sermons preached in today’s churches? Matt.12:28: Come unto me, all ye that labour and are heavy laden, and I will give you rest. Change to: Come to church, all ye that labour and are heavy laden, and I, the preacher, will give you no rest. Verse 29: Take my yoke upon you, and learn of me; for I am meek and lowly in heart: and ye shall find rest unto your souls. Change to: Fill out my pledge card, and learn the ABC’s of faith; for I, the preacher, am merciless and cold of heart: and ye shall find no rest for your souls. Verse 30: For my yoke is easy, and my burden is light. Change to: For my folks are uneasy because my sermons bite. How would you modify the following NT verses to justify today’s tithing doctrine? Does the Holy Spirit require Christian converts to tithe ten per cent of their paychecks to the church? Let’s peek at Acts chapter 15 for a clue. The apostles are debating whether or not new Gentile converts must start keeping the Law of Moses, which included tithing (only on farm produce and ONLY to the Levites). What was their conclusion? What is the modern preacher’s conclusion? Apostles’ conclusion, Part I: Acts 15:24: Forasmuch as we have heard, that certain which went out from us have troubled you with words, subverting (upsetting) your souls, saying, Ye must be circumcised, and keep the law; to whom we gave no such commandment. Preachers’ conclusion, Part I: Forasmuch as we have heard, that certain super apostles which flew to your conference from our mega-church have taught you word of faith theology, challenging your stingy souls, saying the offering needs to be supersized, and you have to hang onto the preacher’s favorite Old Testament law, and that, in a nutshell, is OUR commandment! Verse 29: That ye abstain from meats (foods) offered to idols, and from blood, and from things strangled, and from fornication: from which if ye keep yourselves, ye shall do well. Farewell. Verse 29: That ye abstain from meeting at home instead of church, and from burdening us with unwanted questions, and from starting to think for yourself, and from forcing us to move to a cheaper building: from which if ye keep yourselves, that’s just the start. Oh, we almost forgot. God expects you to tithe ten per cent of your net….we mean GROSS! paycheck! You are dismissed. Are Christians REALLY under grace instead of law? Romans 6:14: For sin shall not have dominion over (rule over) you: for ye are not under the law, but under grace. Change to: For sin shall not rule over you (that’s the preacher’s job); for ye are not under the law (except for certain laws that profit the preacher), and you’d better grease the preacher’s palm if you want to stay in his good graces! Gal.3:10: For as many as are under the works of the law are under a curse: for it is written, Cursed be every one that continueth not in ALL things which are written in the book of the law to do them (that includes every law in Leviticus, including animal sacrifices and ritual washings). Change to: For as many as are under the laws the preacher likes are under a blessing that exists only in their imagination: for the preacher says: Cursed is every one who continueth not to keep OUR version of Moses’ tithing law (don’t forget the firstfruits), but forget dietary laws, circumcision, keeping the Sabbath, etc. Speaking of circumcision, it was just as hot an issue in the days of the First Century church as tithing is in our day. I never hear preachers holler about bringing back circumcision, which legalists in the early church tried to enforce, just like tithing is enforced today. Maybe PROFITABLE doctrine is a bigger priority in the modern church, and that’s why we don’t see many online forums debating Christian circumcision. It’s safe to say that if preachers could get rich from circumcision, they wouldn’t hesitate to transform spiritual circumcision of the heart into a big money-making operation. Money-hungry preachers are so economical with the truth, they’d be able to twist the Word of God and “discover” 1001 reasons why ALL Christians, including the poor widow, had to get circumcised as a requirement for church membership! Can you imagine the big stampede out the church door if circumcision WAS made a requirement for church membership? But week after week preachers are snipping away at people’s paychecks, without God’s authorization. Ten per cent may be the difference between children eating a nutritious meal and having macaroni and cheese five nights a week. Preachers NEVER preach on this one (at least I’ve never heard it done). How would you need to reinterpret this verse to justify tithing? Proverbs 22:16: He that oppresseth the poor to increase his riches, and he that giveth to the rich, shall surely come to want. Change to: He who makes himself poorer to increase the preacher’s riches, and he who showers rich preachers with more money, shall surely reap a hundred-fold harvest of money (what else matters?). Just for fun, let’s examine a passage of Scripture which tells Christians the proper way to give. The context is Paul is taking up a collection to feed hungry saints in Jerusalem. How do tithe-hungry preachers interpret these verses today? 2 Cor.8:11: Now therefore perform the doing of it; that as there was a readiness to will, so there may be a performance out of that which ye have. Change to: Step out in “faith” and make a credit card donation out of what you don’t have yet, believing that the LORD will come to the rescue with a windfall blessing from an "unexpected source". Verse 12: For if there first be a willing mind, it is accepted according to that a man hath, not according to that he hath not. Change to: Your hesitation is of the devil! Hurry up and give before satan argues you out of it! Make a $2,000 vow of faith out of what you don’t think you have yet, because even though you haven’t gotten that money yet, you ALREADY have it by faith and it will soon materialize into the visible realm, so go ahead and pledge it by faith and God will accept it. Verse 13: For I mean not that other men be eased, and ye be burdened. Change to: If our preaching means anything to you, you’ll be willing to pay for it, even if it makes you poorer. Verse 14: But by an equality, that now at this time your abundance may be a supply for their want, that their abundance also may be a supply for your want: that there may be equality. Change to: Charity begins here in this church, not at home! And it begins with us here in this pulpit, so pay up! Forget this notion of us all being lovey-dovey brethren looking after each other’s mutual welfare as equals. That sounds too much like socialism and we’re way too conservative for that! Some sink, some swim. Tough luck. Verse 15: As it is written, He that had gathered much had nothing over; and he that had gathered little had no lack. Change to: God wants ME to have the very finest because I’m far more important than you are. Poverty builds character, and it wouldn’t hurt you to fast a few meals anyway. Verse 8: And God is able to make all grace abound toward you; that ye, always having all sufficiency in all things, may abound to every good work. Change to: And the preacher is able to make the pressure pile up on you; that ye, seldom having enough money left over to pay your bills, may give the preacher more and more. Verse 9: As it is written, He hath dispersed abroad, he hath given to the poor: his righteousness remaineth for ever. Change to: The good Christian limits his giving strictly to the four walls of this sanctuary, he has given to the preacher: his money remaineth here for ever. How does Jesus Himself view the issue of equality in the Body of Christ? Matt.23:8: But be not ye called Rabbi (Master); for one is your Master, even Christ; and all ye are brethren. Peter, James, and John, you three are my inner circle. You’re head and shoulders above the rest, so those church members out in the pews must call you Master. Christ may be your main Master, but there are many others as well. That’s the way the cookie crumbles. Some are masters, some are slaves. Matt.23:9: And call no man your father upon the earth: for one is your Father, which is in heaven. Some will be father figures over you to take tribute from you. Go ahead and call the most important church leaders “Reverend”, “Father” “Holy Father”, “Your Grace”, etc. The Father in heaven is just ONE of many higher-ranking fathers who rule over you. Verse 10: Neither be ye called masters: for One is your Master, even Christ. You will be exalted masters and rule over God’s people as “little gods” in the pulpit. 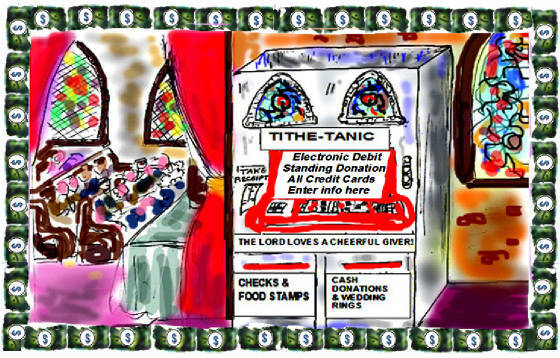 But he that is greatest among you shall take your money and scare you with tithing sermons. One famous televangelist boasted that those who didn’t agree with him would be his slaves up in heaven. Christ did not tell His people to worship keynote speakers at conventions and exalt them above ordinary Christians. Verse 12: And whosoever shall exalt himself shall be abased; and he that shall humble himself shall be exalted. It’s okay if religious celebrities live like kings at the expense of the poor, and unless you fight for your place in the pecking order you’ll end up a third-class peon in heaven. Matt.18:24: And when they were come to Capernaum, they that received tribute money came to Peter, and said, Doth not your master pay tribute? Verse 25: He saith, yes. And when he was come into the house, Jesus prevented (appeared before) him, saying, What thinkest thou, Simon? Of whom do the kings of the earth take custom or tribute (tax)? Of their own children, or of strangers? Verse 26: Peter saith unto him, Of strangers. Jesus saith unto him, Then are the children free. God’s own dear children are FREE from paying taxes to their own kingdom! But tithe collectors in tall pulpits threaten them with the fires of hell for failure to cough up ten per cent of their gross wages and salaries to THEM, the exalted representatives of Big Religion! I think Jesus’ simple words about the children not having to pay taxes to their own Father carries much more weight than ten thousand pro-tithing sermons which appeal to Scriptures that just aren’t there. We are ALL brethren, of equal importance in the sight of God. God even disapproves of lofty titles being used by preachers to set themselves apart from the rest of the Body of Christ as lords over God’s heritage (I Pet.5:3). Giving is to be done cheerfully, to meet true needs. You and I have just as much right to ask a preacher for money (or tithes) as they have to ask us for it!